ALLEGAN, Mich., Jan. 29, 2019 /– Ropes Courses Incorporated (RCI) is at work to assist Lucy “LuLu” Buffett, owner of three popular LuLu’s restaurants in Destin, Florida; Gulf Shores, Alabama; and North Myrtle Beach, South Carolina, in opening her second outdoor Sky Trail® aerial attraction in mid-February at Buffett’s North Myrtle Beachrestaurant at Barefoot Landing. The 48-foot-tall (14.63m) Sky Trail® is being designed and installed by RCI. LuLu’s waterfront location along the Intracoastal Waterway is known for its fun coastal menu and its beach and vacation-spirited merchandise available in its adjacent shop. And, new for 2019, Buffett is adding an extra element of excitement with the debut of her second Sky Trail® in one of her three signature restaurants. Planning and customized design work have been underway for months and RCI began installation of the multi-level attraction in December 2018. The Sky Trail® will include 26 elements to challenge children and adults with such as the themed lily pad stepping stones and a tippy version of “Walk the Plank.” This six-inch-wide beam showcases a color-wheel at its end that draws participants further along the beam for a chance to pull the hanging cable and set the spinning wheel in motion. Thrill-seekers who reach the top of the course have the option of taking the QuickJump free-fall exit – a three-story descent with a gentle landing that delivers a breathtaking grand finale. Every participant is outfitted in a harness equipped with a single redundant slingline that keeps them secure while they work their way among the obstacles using RCI’s U.S.-patented overhead tracking system. This Sky Trail® with its splashy color scheme of hot pink, turquoise and yellow will be eye-catching and inviting to diners as it blends with LuLu’s tropical theme, menu and gifts. RCI has built Sky Trail® aerial attractions in 30 different countries and in a variety of different venues including amusement parks, zoos, community centers, hotels, resorts, cruise ships, shopping centers, adventure facilities and natural or historic tourist attractions. The size, colors, elements and designs are customized to each location to complement each setting. 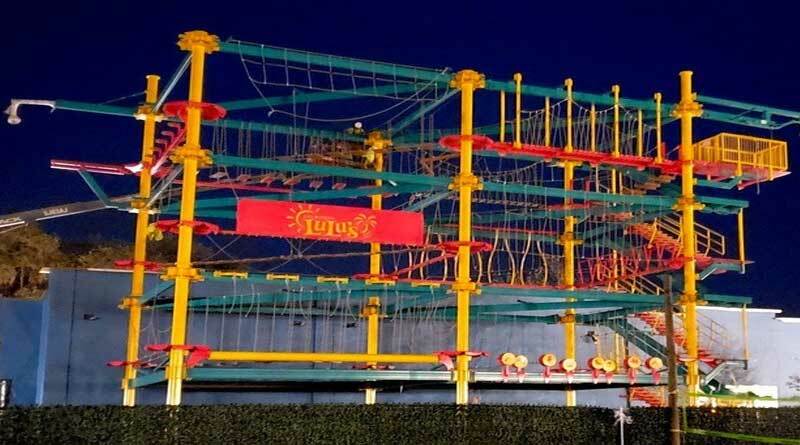 For more information about RCI attractions including Sky Trail®, Clip ‘n Climb® climbing walls and Amaze’n Mazes™, visit www.ropescoursesinc.com.